Like homes everywhere, homes in the rainforest of the Peruvian Amazon have certain tools and utensils common to the area. below are some of these items which can add authenticity to a display. Description Used by the Urarina people to start their cooking fires. Description Used by the Urarina people to make mazato. I find these when I can. Description Used by the Urarina people to make mazato. 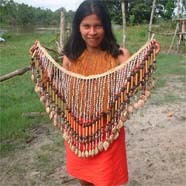 Description: From a village near Iquitos, Peru. I like this pottery but it's hard to ship. I can send it up in cubic meter-size boxes to wholesalers or include it in a larger shipment. Rice is abundant along the Amazon River. It's planted at high water in the flood plain and harvested when the river recedes. The grain is pounded by hand to loosen the chaff then the mix is tossed into the air with the tinaja to separate the chaff from the grain. 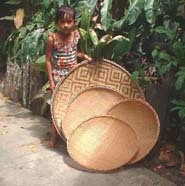 These tinaja are made from the palm and often given a certain decorative flair. Sizes vary from about 1 ft across to nearly 3 ft. Wear it or hang it on the wall.